Everyone’s heard of soccer players exchanging shirts after a game, but exchanging shorts must be a first. 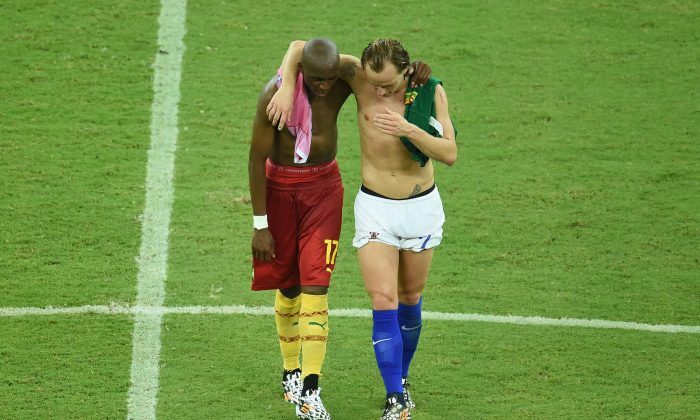 Cameroon’s Stephane M’Bia and Croatia’s Ivan Rakitic must be the first footballers in the world to do such an act. Both players were with Spanish side Sevilla. As M’bia went on loan to English side Queen’s Park Rangers last season, and Rakitic is moving to Barcelona next season, the World Cup match might be the last either see of each other for a while. Check out an Associated Press article on Brazil and Cameroon.